The Acharya Mahasabha, the premier Umbrella organization has, over the past decade, brought under one roof the leading acharyas, Swamis, and other eminent holy figures of the various & diverse sects of Sanatana Dharma / Hinduism. It has been instrumental in uniting the voices of all concerned citizens to articulate issues of major concern to Hindus worldwide. It has been sensitive to the effects ot Academic misinterpretation of Hindu ideas & icons for a while. This third Conference of the Acharya Sabha was held in the ancient Sri Adi Chunchanagiri Matha during February 9 to 11, 2008. The Acharya members present heard the Secretary’s report and the Convener’s observations. With that background, the Acharya Sabha deliberated on a variety of topics of concern and interest to Hindus world-wide and in India in particular. The substance of the deliberations and conclusions appears in the brief Statement below. It is followed by the Resolutions passed on individual topics in the Agenda considered by the Acharya Sabha. Distortion and Denigration of Hinduism by academicians. 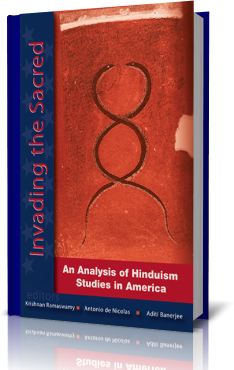 · under the deeply flawed notion of what secularism means, school and college curricula avoid any serious Religious studies in the country in an academic setting; this affects Hindu thought particularly. · colonial constructs and colonized mind- set must be exposed in an academic setting, and in media-debates, journals and in scholarly publications, for which financial and other forms of support should be extended by Acharyas and their well-to-do devotees.